I spent two recent weekends at two quite different folk dance festivals, neither of which I had been to before. Saturday evening there was a French (Balfolk) dance night which was excellent. Two great bands, lots of cool people, lots of great dances. Sunday evening there was an ‘Anglo-International Barn Dance’ which turned out not to be very interesting, and a swing dance night hosted by Swing Patrol which was alright, though there were not that many people. It was nice to have plenty of space and a nice floor though, and I did get some good dances. The following weekend was Skint, which was excellent. It runs annually in a parish hall in Ashover, a bit south of Sheffield, and is limited to around 100 people. Tickets sell out in minutes. The name apparently refers both to ‘Scandinavian and International dance’ and the fact that it is really cheap (£45 for the whole thing Friday–Monday including meals and accommodation? Woah!) Dances are primarily Balfolk (French, which I really enjoy) and Scandinavian (which are also interesting, though not so much my thing), though with a mix of other styles as well. Workshops were all taught by volunteers; there were three at once during the day, usually one dance, one music, and the third either another dance or something different. We all took turns to cook and clean and ate all meals together. Each evening the main organised dance ran until around midnight, then there was midnight cheese (an excellent idea!) then more dancing in a smaller room with any musicians who wanted to join in playing whatever they felt like. Probably half the people there played at least one instrument, so there were never any shortage, and often the musicians outnumbered the dancers at the late night sessions. Dancing in the middle surrounded on all sides by a circle of 20 musicians playing all sorts of instruments was magical. There were a lot of great dancers as well, and I had a bunch of switch dances (mostly French schottisches and mazurkas) which was cool, trying to spread the idea. I ended up dancing until about 2:30 am on Friday night and 3:30 am the following two nights, so really did not get enough sleep, but it was worth it. I took a few photos (also on Facebook) but Ben and David posted some much better photos. 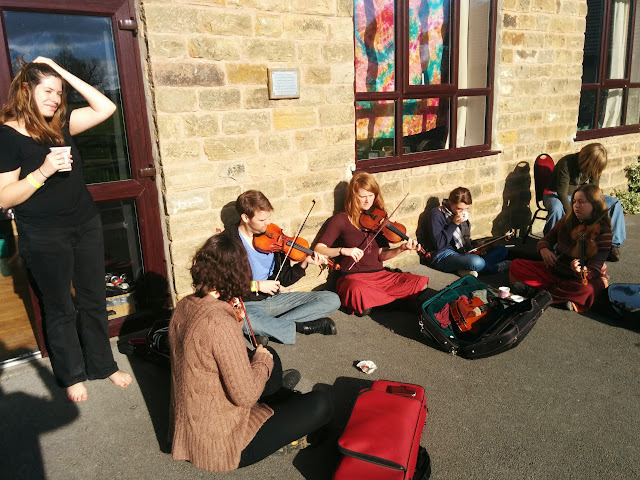 On Saturday I did the Fandango, Contra, Polska, Irregular Waltzes and Sønderhoning workshops. On Sunday I did Playford, the first half of the Swedish waltz workshop, found I was not getting it so gave up and went to try singing Sacred Harp instead, “Out of Body Dancing” (which was a fun experimental workshop about connection and musicality, sort of) and Wallonian / Flemish. Monday did not have any workshops, sadly, mostly just cleaning up. All in all, an excellent weekend, and lots of new friends! I highly recommend it, and will be going back next year. My phone somehow turned itself off overnight, despite having plenty of battery power left, so the alarm did not go off in the morning. I woke up at about 9:15 am. Whoops. Hurried to work and had a small breakfast at my desk. Finally made muffins with Luca and some of her friends and flatmates. We made one batch of blueberry and cinnamon and one batch of lemon and yoghurt. Neither turned out right; they just did not cook properly for some reason. Neither of us had either recipe before, and they had some oddities. I think next time I will stay with recipes I am familiar with. They tasted alright, but just fell apart completely or were a bit stodgy. Had a couple of friends over for dinner. My flatmate Steph joined us too, which was nice. I do not get to eat with my flatmates very often sadly. I made a beef stir-fry, and apple scotch for dessert. Chatted about stuff. Worked late as I had things to finish for deadlines at work. Left work around 9:00 pm I think. Missed Springboard. Did not do much else. Went to Blues in my Shoes. It was a bit different this week as they were having a sort of unofficial pre-party for London Swing Festival, so they played a mix of blues and swing, and there were a few people from out of town who had come for the weekend. A bunch of unfamiliar faces who were apparently new regulars as well — I had not been for quite some time as I was away in New Zealand, then was too tired, then it was on a different day, so it had probably been almost 2 months since last I went. I found the mix of DJed music a bit odd. They had Dan Nash playing later on though, which is always good. Was tired and knew I had a full weekend coming up, so did not do much. Did not go to the London Jitterbug Championships, though I heard they were great fun. Day one of London Swing Festival. I did the intermediate/advanced track this year, which I think was the right choice. There were about 5 hours of workshops during the day plus an hour for lunch and a couple of short breaks. My workshops were in the Islington Assembly Hall, which is a nice venue but has an extremely bouncy floor. I have never been anywhere quite like it: you can feel people dancing on it from across the hall, and even see it bouncing if you watch. I wonder what its resonant frequency is? The workshops focussed mostly on technique, which was good. They were also mostly not too high-energy which was a relief. I went home for dinner, a shower and a brief nap before the Saturday night dance at the Camden Centre. Saturday night was scheduled to finish around 4:00 am. I had planned to leave around midnight, but when I checked the time I found it was 1:30 am, so that did not quite work. It was excellent fun though, good music (Steve Coombe’s Hot Six playing, plus the usual DJs), and lots of great dances. The only problem, other than it getting very crowded for a while in the middle, was that the Camden Centre has an extremely slippery floor. I started off in my (leather-soled) Aris Allens, but after a few dances of struggling to keep my balance and not slip over I gave up and switched to some rubber-soled shoes. My dancing improved quite a bit once I no longer had to worry about falling over. The Rainbow Connection has been going through my head all day. Humming the tune to myself in time to my steps as I walk down the street. Went to church in the morning as usual, the 11:30 am service. Matthew was there, with a friend of his who is visiting from NZ for a couple of weeks. The sermon was about spiritual gifts, among other things, from I Corinthians 12:1-11. I disagreed with some of the implications made by Rico Tice; it is a pity that there is never much of an opportunity for discussion. Oh that I could find the perfect church! Afterwards I walked down Oxford Street and through Hyde Park and Kensington Gardens to a pub in Kensington for lunch to celebrate Fi‘s birthday. She was a bit late to arrive (for the fairly reasonable excuse that it was her first day getting around without a wheelchair, just crutches), but fortunately I was able to find two of her friends who were there already. In the end 6 of us got there before her, to much amusement. ‘Twas good to catch up a bit, and chat to a few nice people, and the food was good too. I had a tasty beef and bacon burger. Afterwards I caught a bus down to Clapham Junction to catch the end of an afternoon swing-dancing fundraiser a friend was running for a movie she is going to be involved in making. I got there in time for a bit of dancing, said friend singing a couple of songs (she has a great voice, I had not heard her sing before; she has a number of videos on Youtube though, such as this one), a duo on ukelele and banjo playing a couple of songs for everyone to sing along to, an amusing short act by two Victorian time-travelers, and then a band playing a great set for us to dance to. The band was more rockabilly than swing, but great fun and very energetic. They did throw in one more bluesy tune in the middle which was nice. It has been much to long since I have done any blues dancing, I really need to get back into that! There were some tasty homemade cakes on sale too; I had a bit of ginger cake and a macaroon. It was a good afternoon, but exhausting. Afterwards I bussed home, had some ryebread with cheese and marmite, did a load of washing, and called my mum to walk her through the process of moving her new harddrive from her computer to my old computer (which is marginally newer and hopefully less noisy, and had been sitting in the basement unused for the past 3 years). The only complication was that apparently for some reason my computer names its Ethernet interface eth1 rather than eth0, so we needed to update a config file accordingly. And GRUB is giving an error message ‘out of disk’ on a cold boot, which goes away after resetting. Rather odd, but at least there is a workaround for now. Has anyone come across anything similar before? This is GRUB 2, and it is booting from a 1 TB SATA drive. What little information I can find online seems to suggest it might be something to do with the BIOS not liking large drives, but that does not explain why it works on the second try. Watched the final episode of this series of Doctor Who on iPlayer. It was alright. I have not been impressed with this latest series on the whole, especially the second half. Hopefully they will find a new writer to replace Steven Moffat sometime soon. He did start off well, but seems to have run out of good ideas. I was going to be making muffins with a friend this morning, but sadly that fell through. I slept instead. Finally got up at about 11:45 am. That is the most I have slept in in a long time. Perhaps needed though, I had not been getting enough sleep lately. Did not do anything terribly productive. Bought groceries for Tuesday’s dinner-party. Ate the left-over pizza in the fridge from Monday’s dinner which I had forgotten about; it was still mostly edible, if a little stale (or soggy, in one part. That was weird.) Washed some clothes and my towel. Did not quite get around to doing the vacuuming I had planned to do. Made a smoothie, and the blender leaked. In the evening I went out to a contra up in St. Albans. The caller was excellent, and the band were decent, but it was almost all old people which was a pity. My attempts at getting people from London to come along were not very successful, only Gareth came. Still, mostly enjoyable. The train back stopped at Blackfriars so I Boris-biked from there, and got home some time after midnight. I wonder when I will watch tonight’s Doctor Who episode. Certainly not tonight, it being 12:55 am, and probably not tomorrow night either. Maybe Monday. Things to be done: vacuuming, selecting and cropping a passport photo, working out how tall I am and what my eye colour is called, sleeping, writing a blog post about dwarves, finding a new time for muffin-making, thinking about plays to go to, organising travel plans for the summer. What else have I forgotten? Friday! Busy day at work, as it has been since I got back. This week’s TGIF (our Friday afternoon drinks) were Eurovision themed, which meant various Eurovision songs playing in the background, flags hanging from the ceiling, and food (supposedly) from various different European countries. I left to have a nap at home before going up, but I only ended up with about 10 minutes to nap in the end. Went to an English ceilidh I sometimes go to, which happens once a month at Cecil Sharp House, the home of the English Folk Dance and Song Society up in Camden Town. For some reason there were not many people there this month, only about half to a third of the usual number. And only a couple of people I knew. Still, decent fun. Decent band, good caller, younger than most of the usual ones. Nothing particularly out of the ordinary. I do tend to prefer the contra a lot more these days. Bedtime soon, I just need to send a few messages organising next week’s dinner party. Doctor Who finale tomorrow! And the St. Albans contra, if I go to that. And maybe muffins in the morning. Nothing terribly exciting. Let’s see. Oh, the weather was relatively nice today. Still a bit cold, but nice and clear. I think this morning was my first time for the year eating breakfast outside in the sun on the balcony. I ate lunch outside as well. The weather not being so warm did have the advantage that there were still seats available outside. Food Revolution Week continues at work. This afternoon there was another cooking demo, with four different types of stir fries based on chicken, tofu, beef, and some sort of seafood, with all sorts of vegetables, rice, and various different sorts of noodles. They were all tasty (except for the seafood, which I do not like). A fair bit of work to do. My bike ride home is quite scenic, if I can take the time to look up from the road. On my 15 minute ride, at around 9:30 pm this evening, I could see the MI6 building, Westminster Palace, the London Eye, the Shard and the Imperial War Museum, all nicely lit up. No blues dancing this evening sadly, as the night I usually go to was moved to Wednesday this week, so I could not go. Starting to organise having friends over for dinner next week sometime. And making muffins with other friends. I got some photos for my passport today, so I need to pick one and crop it, then measure my height so I can put in the online application at some point soon. And I still need to sort out my Boris bike account, which for some reason I cannot login online to update my debit card details. There was a cooking demo at work this afternoon as part of Food Revolution Week. Apparently it is only a day in the outside world, but all week at Google. Anyway, some celebrity-ish chef showed us how to cook 5 recipes from her cookbook, and we got to try some of the results. The only one I am likely to make, if I get the details, was a dessert made from double cream, lemon juice, sugar and rosemary, and served in shot glasses with a raspberry on top. A quick search suggests that this is called a posset. The rosemary seemed like a strange addition, but it actually worked really well, adding an interesting flavour. I might have to try it myself sometime. I watched the first part of the Google I/O keynote at work before heading to Springboard, a course I am doing at church on Wednesday evenings. Biking through Hyde Park in the light is really quite a different experience than when it is dark and rainy. Last week was my first time doing so, not having biked that route in the previous month (since BST started) as I was away in New Zealand. The ride home was a bit slow due to various roadworks, and trucks stopping in bad places. I spent the rest of the evening in a G+ Hangout with my mum again, this time trying to fix bootloader issues so she could boot of her new hard drive successfully. We got there in the end, but it would have been much quicker if I had been in the same room; remotely diagnosing problems when I cannot very easily see what is happening or type directly is rather fiddly. And now it is too late again. Goodnight.